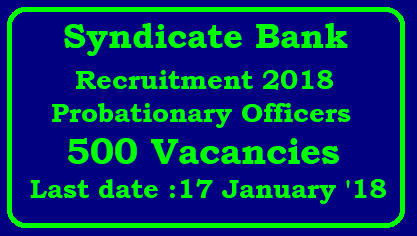 Syndicate Bank Recruitment 2018 for Probationary Officers through PGDBF Programme.Candidates who completed the course will be appointed as Probationary Officers in Syndicate Bank across the country. The detailed eligibility and application process are given in below. Candidates shall be selected by Syndicate Bank through a selection process consisting of an (open) online test conducted by IBPS followed by Interview and/or Group Discussion. The selection process aims at getting applicants who are likely to succeed at various roles in the Bank. The endeavor is to select people who are bright, dedicated, have good communication skills (both oral and written), can work effectively in teams, are passionate about their career goals and who display integrity and a positive attitude. During nine months class room training the students shall be paid a sum of Rs 3000/- pm as stipend and during the next three months of internship a stipend of Rs 15000/- pm shall be paid. How to apply Syndicate Bank Recruitment 2018? All interested and eligible candidates can apply for this position in online from 2 January 2018 to 17 January 2018.